Synonyms and Other Names: (liberty molly). Identification: Distinguishing characteristics were given by Miller (1983). However, there appers to be a good deal of confusion among species of shortfin mollies in the literature. Miller (1983) provided a key to this species and other Poecilia found in Mexico. Photographs or illustrations appeared in Schultz and Miller (1971), Mills and Vevers (1982), Axelrod et al. (1985), Petrovicky (1988), Dawes (1991), Sakurai et al. (1993), and Wischnath (1993). This species is part of the P. sphenops complex (Rosen and Bailey 1963; Schultz and Miller 1971; Brett and Turner 1983; Miller 1983). Formerly known as Mollienesia sphenops. Size: 10 cm TL, but commonly smaller. Native Range: Atlantic Slope of eastern Mexico from north of Veracruz City to Guatemala (Brett and Turner 1983; Miller 1983). Some authors state it ranges south to Colombia (Wischnath 1993) but that may be the result of taxonomic confusion. Table 1. States with nonindigenous occurrences, the earliest and latest observations in each state, and the tally and names of HUCs with observations†. Names and dates are hyperlinked to their relevant specimen records. The list of references for all nonindigenous occurrences of Poecilia sphenops are found here. Means of Introduction: Introductions have resulted from escapes, intentional releases from fish farms, and releases by aquarists (Lee et al. 1980 et seq. ; Dill and Cordone 1997). Status: Locally established in Montana and Nevada: failed in Florida; reported from California and Arizona. Established in Puerto Rico. Impact of Introduction: Introduced populations have adversely affected the Moapa dace Moapa coriacea and the White River springfish Crenichthys baileyi (both endangered species) and are a potential threat to other native fishes in the Pahranagat Valley, Nevada (Lee et al. 1980 et seq.). 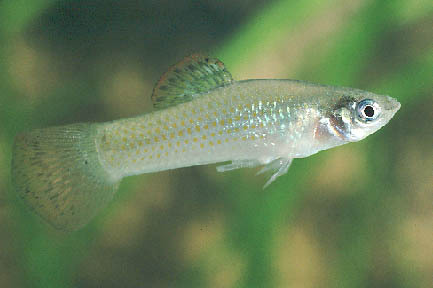 Scoppettone (1993) attributed the effects on the Moapa dace to be caused by P. mexicana, so the question of identity is raised again. Remarks: Some, conceivably all, of the records of this species in the United States may turn out to represent one of the other members of the P. sphenops species complex and not P. sphenops. For instance, the Hawaiian records of P. sphenops (Maciolek 1984) and that of P. mexicana (Devick 1991) are now considered the same fish (Poecilia sp. ; Mundy 2005). Similarly, Schoenherr (1979) reported taking P. sphenops from a canal northwest of the Salton Sea in California; however, according to Dill and Cordone (1997), later authors questioned the identification and therefore did not include P. sphenops in their listings of California fishes (e.g., Hubbs et al. 1979; Shapovalov et al. 1981). At least five members of the P. sphenops species complex have been reported from the United States (Courtenay and Hensley 1979). There are 2 voucher specimens from Hawaii from a 1976 collection on Oahu (USNM 247410.5105873). Brett, B.L.H. and B.L. Turner. 1983. Genetic Divergence in the Poecilia sphenops complex in Middle America. Systematics and Ecology 11: 127-137. Dawes, J.A. 1991. Livebearing fishes. A guide to their aquarium care, biology, and classification. Blandford Press, London, England. Devick, W. S. 1991. Patterns of introductions of aquatic organisms to Hawaiian freshwater habitats. Pages 189-213 in new directions in research, management and conservation of Hawaiian freshwater stream ecosystems. Proceedings of the 1990 symposium on freshwater stream biology and fisheries management, Division of Aquatic Resources, Hawaii Department of Land and Natural Resources. Grana, F. - Puerto Rico Department of Natural and Environmental Resources, San Juan, PR. Hubbs, C.L., W.I. Follett, and L.J. Dempster. 1979. List of the fishes of California. California Academy Science Occasional Papers 133:1-51. Miller, R.R. 1983. Checklist and key to the mollies of Mexico (Pisces: Poecilidae, Poecilia, subgenus Mollienesia) Copeia 1983(3):817-822. Mills, D., and G. Vevers. 1982. The Golden encyclopedia of freshwater tropical aquarium fishes. Golden Press, Racine, WI. Schoenherr, A A. 1979. Niche separation within a population of freshwater fishes in an irrigation drain near the Salton Sea, California. Bulletin of the Southern California Academy of Science 78(1):46-55. Schultz R.J., and R.R. Miller. 1971. Species of the Poecilia sphenops complex (Pisces: Poeciliidae) in Mexico. Copeia 1971(2):282-290. Scoppettone, G.G. 1993. Interactions between native and nonnative fishes of the upper Muddy River, Nevada. Transactions of the American Fisheries Society 122(4): 599-608.